Learn my approach to color and caning in this fast paced two- (or-three-) day workshop. 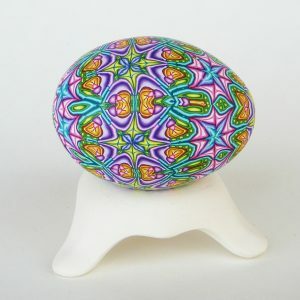 Take home a a beautiful intricately-patterned bracelet or egg and, if there is time, a pendant. In the 2-day version of this workshop students choose to make either a bracelet or an egg. In the 3-day version they make all three. You will begin by mixing color blends from primary colors, using Skinner blend patterns I have developed specifically for this purpose. You will learn how to modify your blends to maximize the light/dark contrast and how to construct relatively simple canes that emphasize this contrast. Several cane types will be demonstrated. Next, you will combine your canes into a more complex, “base” cane. A portion of the base cane will be reduced, cut and reassembled to produce a new cane with a detailed repeating design. 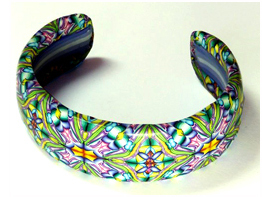 The rest will be set aside for a kaleidoscope pendant. Using my special slicer, you will slice your cane into thin, even slices and use them to veneer a metal bracelet blank or an empty shell of an egg. I will share many tips on how to achieve the highest quality results including cane construction, veneer application, sanding, buffing and drilling techniques. 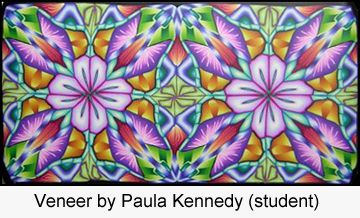 Time permitting, I will demonstrate my techniques for forming and veneering a kaleidoscope pendant. I will also show you how to store and transport the remaining slices so you can create more veneers at home. This is an information packed 2-3 day workshop. If the 2-day version is selected there is the option of adding an evening studio (recommended). 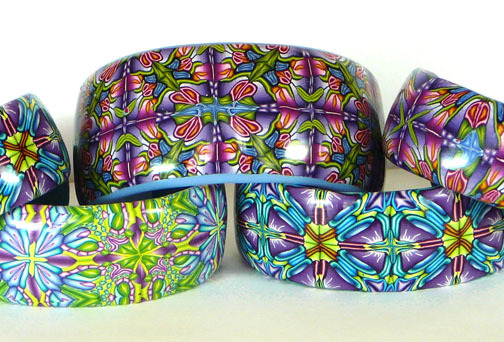 The three day version allows students to explore these techniques in greater depth and gives them enough time to complete both the bracelet and the egg. 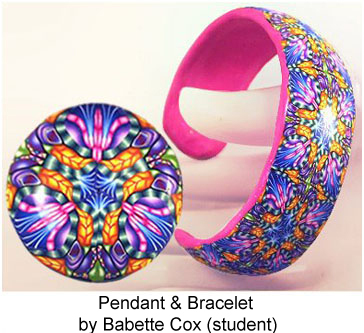 Most students also complete a pendant. I would love more info on your class we Alice S. Thank you! Sorry Ann Marie, I missed this message when you first wrote it. The next workshop is in Victoria, BC. Aug. 15-16. There are 2 openings left. I will send you an email with more information.